Byington Vineyard & Winery, nestled in the Santa Cruz Mountain, with sweeping views of the Pacific Ocean, provides the perfect setting for sipping wines or celebrating special occasions. The manicured grounds of the Byington estate combined with its Italianate stone winery chateau create a striking backdrop for any occasion. Whether dreaming of an enchanted wine country wedding or planning a corporate retreat, visit Byington Winery. The chateau is one of the most enchanting sites for weddings, engagement parties, and rehearsal dinners in Northern California. It boasts unique private dining areas, a handsome tasting room, a large outdoor terrace perched above the vineyard, and the acclaimed Byington Wedding Hill. Bocce Ball and Wine Tasting — It's Day Trip Time! Picnic facilities are available on a first come first serve basis. However, for parties of 10 or more, reservations are strongly recommended. Our facility provides picnic tables and cloth-covered round tables with chairs and umbrellas. We also have gas and charcoal grills, but bring BBQ tools. Play Bocce on our Bocce Ball Court. We'll provide you with balls and instructions. Private tours and tastings are available for groups of ten or more, by appointment only. Tours are $10.00 per person and include a 45-minute educational and entertaining tour through our vineyard, our production facility and into our wine cave. Following the tour, your host will present you with a selection of our current releases. 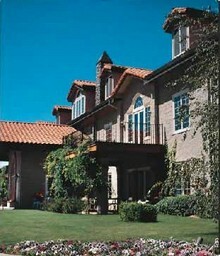 Byington Vineyard & Winery is nestled in the Santa Cruz Mountains, just above the Town of Los Gatos. This unique venue inspires casual company meetings or elegant celebrations. Motivating your winning team is an integral part of your success as a company, and Byington provides the premier facility. We offer cooking classes with local chefs, murder-mystery parties and outdoor activities such as bocce ball or a barbecue. For all of its tranquil beauty and celebratory air, Byington is principally a winery, specializing in the creation of chardonnay and red Bordeaux-style wines. The Byington tradition of winemaking was established with the production of its premier vintage 1987 wines. Known locally as "America's premier mountain appellation," the rugged Santa Cruz Mountains have less than 1000 planted vineyard acres, making grapes from this region a rare commodity. Steep terrain, diverse microclimates, marine influences and sandy soils produce small crops of intensely flavored grapes, yielding complex wines with a great ability to age.